As we prepare for Christmas, and begin to anticipate what Santa will leave us under our trees, I thought it would be interesting to compare the salary breakdown between what our highest paid Phillies players received in their stockings in '08 to what they are receiving in '14. Please understand, as much as I anticipated this being a critique of Ruben Amaro Jr.'s spending and allocation process, by the time you complete reading this article, my hope is that you could reflect on how our team was built then (i.e., in '08), compared to how it is built now (i.e., in '14). Most importantly, to help you appreciate the increase in baseball salaries during the past five seasons, the average salary for that position in 2013 is next to the 2014 salaries. ***2014 salary percentages are based off of top highest salaries as of 12/22/13 and a total payroll of $140,500,000 for those ten players, an average salary of $14,050,000. * Marlon Byrd's WARP differs between his time with the New York Mets/Pittsburgh Pirates. 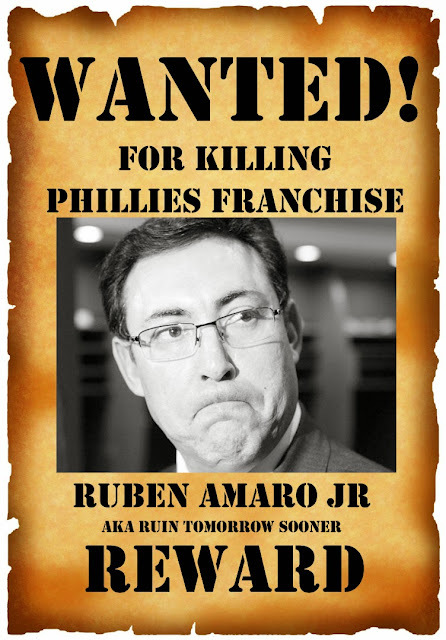 Although Ruben Amaro Jr. has received a great deal of criticism over the past several months, the concern goes back to a point he made earlier this week. 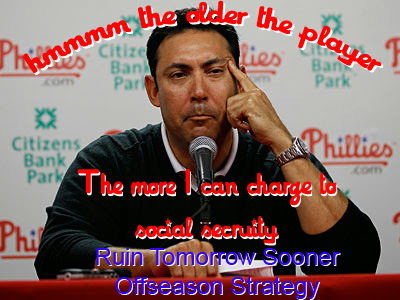 During a December 18th press conference at Citizens Bank Park, Ruben shared "it's about spending the money wisely, and trying to spend it intelligently." 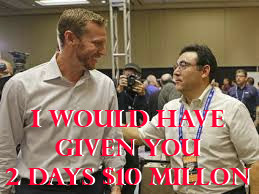 Additionally, Ruben interjected to reporters "why would you spend money that you think is going to be money not well-spent?" Unfortunately, as you scan his top ten salaried players for 2014, one can quickly determine RAJ greatly overspent in his bullpen with contracts awarded to Jonathan Papelbon and Mike Adams. Now one can argue if Adams was healthy, it wouldn't have been a bad gamble. However, when examining the WARP (i.e., wins above replacement), it doesn't take long to deduce that relievers aren't a huge return on investment. Going back to 2008, even in Lidge's perfect season, he was only at 2.24 WARP while Madson who primarily served as the "bridge to Lidge" was at a 1.05 WARP. These two combined at a salary of $7,750,000 and had career seasons. RAJ gambled on two players for 2014 who will cost the team almost three times as much at a price tag of $20,000,000. Overall, I'm glad Ruben has learned his lesson, but it seems a little bit late when two pieces of your bullpen are going to cost you this amount. 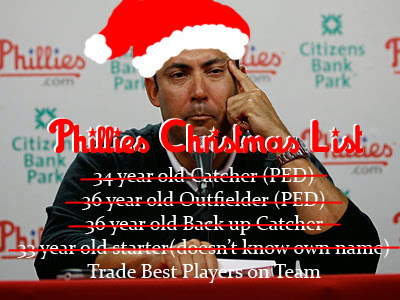 On the bright side, when examining the other players, Cliff Lee, Cole Hamels, Chase Utley and Carlos Ruiz are all wise buys when healthy. One could even argue Byrd is a worthwhile gamble when compared to the average salary for rightfielders in 2013. The concern raised regarding offense is whether or not age will plague these three individuals or any members of the older core as the season unfolds, putting Ryne Sandberg in a precarious position. If productive and healthy, we could begin to hope for a return to career highs in wins above replacement for Rollins (6.5 in 2007), Utley (6.8 in 2007), Howard (4.4 in 2006), Ruiz (5.2 in 2012) and Byrd (4.0 in 2010). Coincidentally, for four of these five players, their career highs occurred during their primes and they haven't returned to this level since and have aged in the process. Ruben hasn't yet seemed to comprehend this fact or if he has is setting the team up for a major sell off in the upcoming season when attendance and victories both begin to plummet. When reflecting on the above then and now comparisons, we can only hope that our top ten salaried players have big seasons, our remaining players play a key role every night, and collectively, the team prides itself on positive chemistry and the desire to win. "Creating a New Chemistry in Philly"
"Strength of a Starting Rotation"
Stayed tuned, keep warm, and reframe this anticipated offseason by breaking out your Hawaiian shirt and singing Mele Kalikimaka! You spend it and I "RUIN" it. heroes of 2008 will get his third chance to win a second World Series ring. I have always love Shane. He was the epitome of Philadelphia sports. He plays hard, loves the game, never gives less than 100% and would sacrifice his body to make a play. He was endeared by the phan base in Philly and is deeply missed by most. But, Shane need this change of scenery to revive his career and he is done just that. 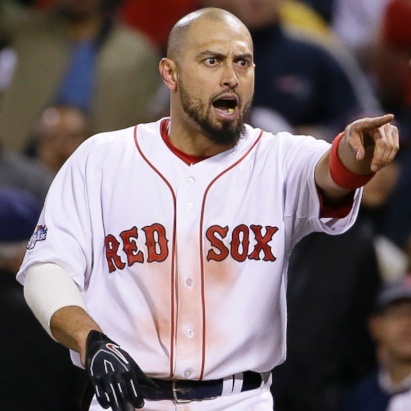 Shanes ALCS Grand Slam is the perfect example of his resurgence. Next week marks the five year anniversary of the Phillies second World Championship and I hope, for Shane, next week brings him another ring to wear. But I know deep down, his 2008 ring will be the one he cherishes and wears the most. Good Luck Shane! I'm rooting for you. On August 16, Charlie Manuel was relieved of his duties as manger of the Philadelphia Phillies. 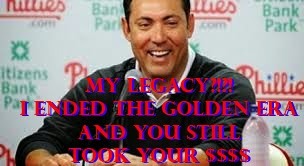 This was a sad day for Phillies Phans, as it marked the end of an era. An epic run that ran from 2007 until 2010. It was easily the greatest run in Phillies history. Since 2007, the Phillies have given us so much to cheer for and I have been lucky enough to be at some of the great moment in Phillies Postseason history. This video you are about to watch, included three of my favorite moments from our epic run. The plays are announced by our beloved broadcasters, Scott Franzke and the Legendary Harry Kalas. Sit back and enjoy three of our greatest moments of the Charlie Manuel Postseason Run.